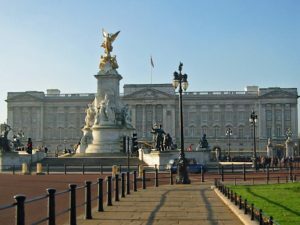 The 775 rooms of Buckingham Palace, located in the City of Westminster adjacent St. James’s Park, include both the official residence of Queen Elizabeth and the administrative headquarters of the British monarchy. Upon becoming king in 1820, George IV began enlarging the Queen’s House as the royal residence. In 1837, newly crowned Queen Victoria moved into the U-shaped Buckingham Palace, featuring a marble arch celebrating recent victories at the opening of its cour d’honneur (court of honor). Victoria soon found the three-sided palace too small for her liking. She enclosed the open end, moving the Marble Arch to its current location at the entrance to Hyde Park. The center of the new eastern façade included the formal entrance and the balcony from which the royal family now greets the public. In 1924, an 82-foot tall marble memorial to Queen Victoria was completed at the front of the palace, featuring a seated queen and statues representing charity, constancy, courage, motherhood, truth and victory. Weather permitting, the changing of the Queen’s guards occurs in front of Buckingham Palace at 10:45 on Mondays, Wednesdays, Fridays and Sundays. The state rooms are open to visitors during the summer.